You're just an ordinary teen girl looking for work after your college dreams didn't quite pan out. But when you get lost backstage during a national debate, you find so much more: a bunch of talking cats who are running for President. And that's not even the weird part—they all want to hire YOU as a campaign manager! Can you handle the world of Presidential politics? Do you even know what a campaign manager does? Will you find love with your candidate in order to form...a more purrfect union? 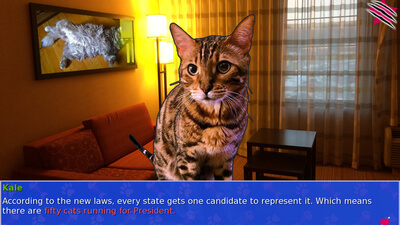 With a script that's over 350 pages long, Cat President is a visual novel packed full of romance, humor and cute pictures of cats. Cast your vote today! Cat President ~A More Purrfect Union~ gives us all a chance to step back from potential fears of the actual impending election and have a laugh at the whole process. 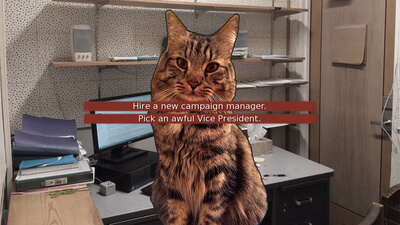 For me, Cat President is just a whole lot of dumb fun; the game isn't visually pleasing, nor is it technical in any leaps or bounds, but my god do I love it - This game is definitely one to keep out of the litter box, and should be set atop the scratching posts of fame for just how much fun you can have with it after a few drinks with some purrfect company.